Can anyone question the value of humor in the early days of the seventh art? In its 19th edition, the San Francisco Silent Film Festival (May 29–June 1) offers up belly laughs and bemusements amidst its diverse programming in the historic Castro Theatre. The festival includes 17 wonderful silent-era features in preserved and restored prints, one program of extraordinary silent shorts and rarities, and the ever-popular “Amazing Tales From the Archives” program. 19 programs in all, and you won’t want to miss one! Not to mention that all films are accompanied by live music! Here’s a rundown of some of silent cinema’s most comic, culinary moments. 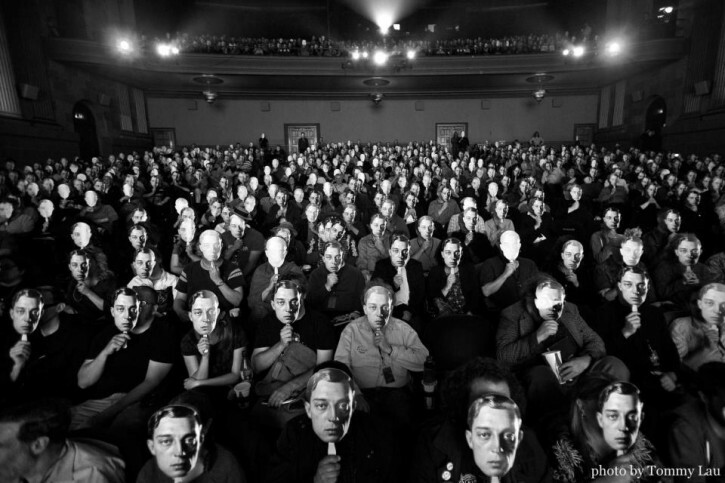 The Buster Keaton Crowd at the San Francisco Silent Film Festival. Photo by Tommy Lau. When the actor, comedian and innovator Ernie Kovacs, then in his early days in local television, got stuck with hosting the afternoon Deadline For Dinner cooking show, he wanted to call it Dead Lion For Dinner. The answer was no. After all, National Geographic Channel didn’t exist in 1950. While fine dining options in the farthest corners of the Serengeti, then as now, prove somewhat limited—and throwing thick, juicy tenderloins from endangered species on the Weber would certainly constitute a faux pas—key rules of etiquette seldom change as society continues rapidly de-evolving through the decades. Of course, nobody knew Emily Post rules regarding swanky (and not so swanky) dining quite like the great comedians and comediennes of silent movies! Here are the following rules regarding fine dining and entertaining, applicable for 2014, but hard and fast as a 1914 Keystone comedy. Illustrating this absolute: a comedienne who was the silent era’s “wacky redhead” and lauded by no less than Stan Laurel—the great Alice Howell (1886-1961). Twenty years before Lucille Ball made her silver screen debut as a showgirl in delirious Busby Berkeley musicals, Alice, the go-for-broke comedienne with a Q-Tip hairdo and a flair for knockabout farce, was tearing it up as a supporting player in Mack Sennett’s rip-roaring Keystone Comedies. She headlined her own series with various fun factories (Henry Lehrman’s L-Ko studio, Century Comedies, Universal) from 1917-1925. Most of her starring vehicles are now lost films, including The Cabbage Queen (1918), in which spies are sent personally by Kaiser Wilhelm to steal Alice’s recipe for sauerkraut—yes, almost a half century before Woody Allen’s What’s Up Tiger Lily? and Phil Moskowitz’ coveted egg salad. Here’s maestro Alice, skillfully conducting a bunch of slobs through a tuneful luncheon in Cinderella Cinders (1920). Forget those ZAGAT ratings, just be sure there’s rhythm in the kitchen! Illustrating this: a bit of culinary terpischore by Buster Keaton and Roscoe Arbuckle, from The Cook (1918). Isadora Duncan was jealous! Mr. Arbuckle was Keaton’s mentor in the movie business. When the popular star of Mack Sennett’s Keystone comedies launched his own studio, Comique Productions, and a new series in 1917, a happenstance of felicitous circumstances brought him in contact with Buster Keaton. Roscoe immediately cast Buster in The Butcher Boy , the comedy he was shooting that day, which turned out to be the first in the Comique Series. Frequently described as “slapstick ballets”, the Comique two-reelers are to this day the most amazing displays of pure physical comedy ever produced, a veritable “can you top this” of somersaults, falls and impossible stunts. Co-stars, Arbuckle, Keaton and Al St. John constituted a slapstick “dream team”; all three could act, write and direct. The trio would continue collaborating after the 1921 scandal that sold a gazillion Hearst newspapers and got Arbuckle banned from appearing in films. Arguably the most famous silver screen example of NOT boring one’s fellow diners to tears is the dream sequence from Charlie Chaplin’s The Gold Rush in which The Little Tramp performs “the dance of the potatoes” or “the Oceana Roll”. As this routine was originated in the 1918 film Rough House by the aforementioned Roscoe Arbuckle, it is not only possible but likely that this scene was Chaplin’s homage to his friend and colleague from Mack Sennett’s Keystone. Once Charlie got that pesky penchant for pie-throwing out of his system with the mayhem of A Night in the Snow (Essanay, 1915) and an epic dessert-throwing melee in the 1916 Mutual two-reeler Behind the Screen, he was off to create a blend of comedy and pathos, exemplified by not just The Gold Rush, but The Kid, The Circus and City Lights. And, in the category of the social faux pas, the ultimate in “what not to do” when out on the town can be found in That’s My Wife, a film devoted to cramming as many episodes of public embarrassment as possible within a 19-minute running time. This Laurel & Hardy vehicle is also devoted to jokes that absolutely, positively, could not be done once strict enforcement of the Production Code hit the movie business like a slapstick style “ton o’ bricks” in July 1934. Here, The Boys demonstrate a conspicuous lack of social graces in public while re-doing a routine previously performed brilliantly by Charley Chase and Gale Henry in His Wooden Wedding (1925). Premise: how does one retrieve a jewel that has fallen down a lady’s gown? There are comedy buffs who will never, ever order oyster stew in a restaurant because of the following routine. It’s a good bet that beachfront comics in coastal societies 6000 years ago did this bit even earlier than “The Mirror Routine” (immortalized by the Marx Brothers in Duck Soup after at least two versions by Max Linder, another by Christie Comedies’ Billy “The Goofy Gob” Dooley and one by cinema pioneer Alice Guy Blaché). Here is the first instance of “the oyster bit”—later remade in talkies by Curly Howard and Lou Costello—performed by Billy Bevan in this Mack Sennett comedy Ice Cold Cocos directed by Del Lord. In From Soup to Nuts (1928), a social climber played by Anita Garvin gives a dinner party for the hoi polloi. Her first mistake: wearing a recalcitrant tiara. Her second: hiring Laurel & Hardy as wait staff. This, indeed, was the plot premise from Pass the Gravy (1928), from the Max Davidson series, just one of director Leo McCarey’s many way-out takes at the Hal Roach Studio on the sitcom format. This series, starring veteran character actor Davidson (1875-1950) as the ever-aggravated patriarch of a Jewish family, was produced between McCarey’s history-making stints creating the Charley Chase and Laurel & Hardy comedies. In Pass the Gravy, Max’s son—told to score a chicken for dinner—goes the 21st century foodie route, does Michael Pollan AND Barbara Kingsolver proud and kills a bird personally; alas, it’s the neighbor’s prize rooster, and Brigham and said neighbor are coming over for dinner. A series of desperate efforts to conceal this knowledge from Max, including some stellar impromptu dancing and general tomfoolery by supporting players Martha Sleeper and Gene Morgan, ensue. As Max’s stock in trade was the middle-aged immigrant, ever-vexed by the customs of his new country, his films can be a hard sell for young 21st century audiences. Davidson’s movie career dated back to the 1911-1912 Biograph short subjects of D.W. Griffith and included playing supporting roles for top comediennes “Madcap Mabel” Normand and Fay Tincher. Max received some belated respect when the 2007 San Francisco Silent Film Festival showed a 35mm restored print from UCLA Film And Television Archive of The Boy Friend (1929) as part of a Hal Roach Studio retrospective. IN CLOSING: Such dining dos and don’ts would extend far beyond the “microphone in the plant” era immortalized by Singin’ In the Rain. The Three Stooges, a.k.a. Los Tres Estúpidos, backed by ex-Sennett gag writers and directors Del Lord and Clyde Bruckman, made a career of remaking silent comedy jokes involving dining improprieties on an epic scale. In feature films, Jacques Tati’s Monsieur Hulot would carry on the silent comedy tradition that began with Parisian boulevardier Max Linder with style and panache. In the post-World War II comedy landscape, no less than Buster Keaton, along with Sid Caesar, Imogene Coca, Lucille Ball, Jackie Gleason and the aforementioned Ernie Kovacs, would bring their unique approaches to dining mayhem and visual humor into the television age. We’ll give Mr. Kovacs the last word here. Although he did not get the opportunity to introduce the 1917 Fox Sunshine comedy Roaring Lions and Wedding Bells during his stint as the host of “Silents Please”, by the time Ernie wrote his 1961 ABC series, a groundbreaking blend of surreal comedy, music and out-of-the-box thinking, he delivered a laugh-starved Cold War world . . . a dancing chicken in Kitchen Symphony. Paul Etcheverry, the co-founder of the KFJC Psychotronix Film Festival, has been writing about film humor and curating classic comedy and animation retrospectives since 1981. He is also Way Too Damn Lazy To Write A Blog. Paul splits his time between the San Francisco Bay Area and Ulster County, New York. This entry was posted in Films and tagged Films, food films, San Francisco Silent Film Festival, silent comedians. Bookmark the permalink.